This relic print pictures the first DH-4 to roll off the assembly line of the Dayton-Wright Airplane Company at Dayton, Ohio – in 1917. Orville Wright was a consulting engineer for Dayton-Wright at the time. The print image shows him on the left, standing in front of the DH-4, next to Howard Rinehart, the company test pilot. 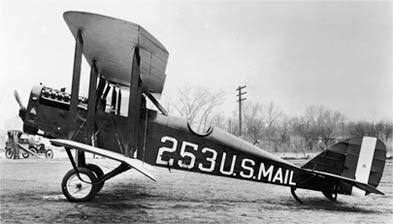 On May 13, 1918, Orville made his last-ever flight as a pilot, flying a 1911 Wright Model B alongside this very DH-4, which was piloted by Rinehart. He then flew as a passenger in the same DH-4 with Rinehart. There is a spine-chilling story of an early test flight in this DH-4 with Rinehart as pilot and a Dayton-Wright employee sitting in the rear cockpit. Rinehart put the aircraft through its paces with a series of aerobatic maneuvers and while flying inverted, the wood screws holding the rear cockpit seat in place stripped – nearly dumping the passenger out of the aircraft! Designed as a bomber and observation plane, the DH-4 was flown by the Allies over European battlefields in World War I. England’s Geoffrey de Havilland was the DH-4’s designer but the Europeans weren’t able to produce them fast enough for the war effort, so they asked the United States to help. There were problems getting the DH-4 into production at the Dayton-Wright plant. Not nearly enough lumber was available so they had to find enough suitable trees, locate lumber mills and build kilns to dry the wood. 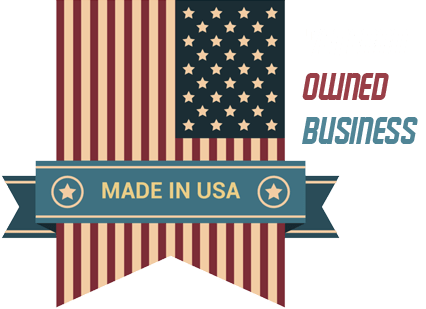 A total of 3,106 were then built at Dayton-Wright, while the Fisher Body Division of General Motors built 1,600 in Cleveland, Ohio. They were loaded with armament – six 25 pound bombs, two wing-tip flare holders, two fixed, forward-firing .30 caliber machine guns and two articulating .30 caliber machine guns in the observer’s rear cockpit. The 400hp Liberty engine gave them a top speed of 124 mph, which was equal to or greater than most of the German fighters in combat then. There were six Medals of Honor awarded to Americans flying the DH-4 in World War I. Two were awarded to airmen of the First Marine Aviation Force and four to U.S. Army Air Service aviators. Your 15″ x 20″ relic print has attached to it a 4-square inch of fabric which was preserved when the DH-4 was restored by the Smithsonian – where it is on permanent display today. 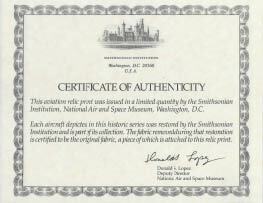 Also included is a Certificate of Authenticity signed by an officer of the National Air and Space Museum as well as 2 pages of colorful historical information and aircraft specs. This is aviation memorabilia at its best – cut from the cloth of history – and an excellent gift for the World War One enthusiast. 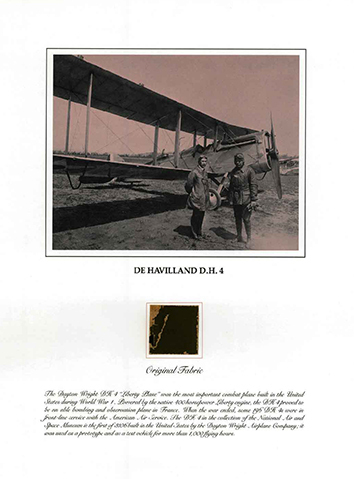 Our supply of the De Havilland DH-4 relic prints is limited to the fabric preserved when the aircraft was restored by the Smithsonian Institution. The De Havilland DH-4 relic print is a great match for another of our relic prints, the German Albatros D.Va fighter. They were both front line aircraft as mortal adversaries and aerial combatants in World War I. World War One Package – free shipping on any order of both the German Albatros D.Va fighter and the British De Havilland DH-4 bomber.